Yee-haw! Time for a Country Cookout! Whew! Now that we are all recovered from Splashdown For Kids, we’re gearing up for the next fun event – our 1st Annual Communities In Schools Country Cookout! All you cowpokes out there can come out to that purty green spot at Town Square and throw down your picnic blanket and enjoy some country music, courtesy of local band Thrillbilly Deluxe and some hot n’ spicy BBQ, courtesy of Pot Liquor! We’re so excited! We think this is going to be a blast and want everyone to come out and enjoy it with us. Tickets are on sale now for $25 per person – young’uns are $15 a head and varmints under 2 get in free! Click here on your newfangled computin’ device to purchase. 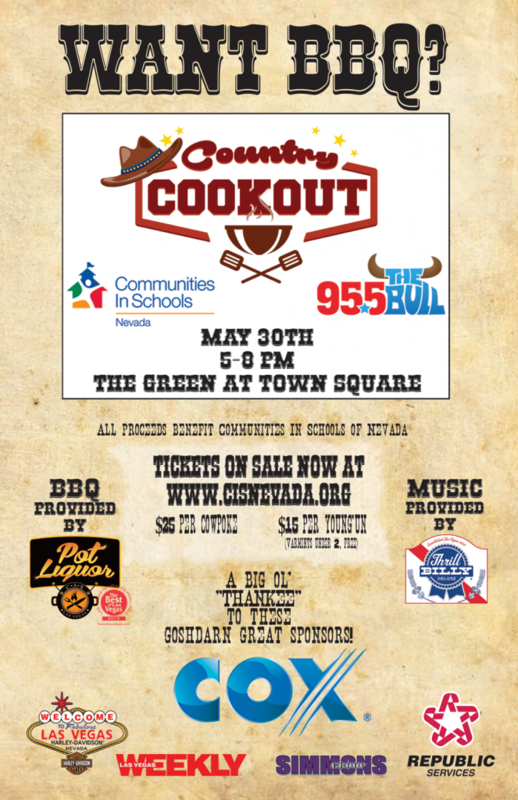 We have to give a big holler to our pardners in crime – 95.5 The Bull, Pot Liquor, Thrillbilly Deluxe, Las Vegas Harley Davidson, Republic Services, the Simmons Group, the Las Vegas Weekly and our title sponsor, Cox Communications for helping us pull this off – so y’all come out show your support for Communities In Schools while you enjoy some vittles and some music.